By 1966 construction contractors had excavated more than 3 million cubic yards of clay, sand, rock and other materials in order to build 15 miles of rapid transit across Metro Toronto since the city began to build Canada’s first subway in 1949. A desire to improve the efficiency and speed of mobility for the growing metropolitan area influenced the construction of a basic network of subway lines, as transit and planning officials urged the separation of private and public transportation routes on dedicated rights-of-way. For Toronto’s transit network, this meant the replacement of heavily-used streetcar lines with rapid transit trains running in two human-made environments of mobility: open-cut ditches and underground tunnels. My paper for the upcoming Environments of Mobility in Canadian History workshop examines the ways in which subway excavation during the building of the Yonge and Bloor-Danforth-University subways impacted peoples’ understandings and experiences of environment, and altered Toronto’s material landscape. I uncover how scientific groups, such as the National Research Council, the Royal Ontario Museum, and numerous geologists at the University of Toronto, felt that subway construction presented a unique moment to study Toronto’s geological history. Excavation – surging meters deep in various layers of soil and millennia deep in time – provided researchers with a unique moment to create knowledge of the city’s complex stratigraphy, motivated in part by the realization that such knowledge was essential for the predicted wave of downtown skyscraper construction in Canada’s major cities. However, the excavation and transportation of subway soil negatively impacted Torontonians along the paths of subway construction and routes of soil-filled dump trucks. Merchants complained that dirt blocked their display windows and obstructed their entrances, while residents protested that debris deposited by dump trucks passing through the streets of desirable neighbourhoods created temporary unsanitary environments. Subway soil also served as useful material for various infilling and landmaking projects across the Metro area. Sub-contractors, through arrangements with civic authorities, transported excavated dirt to various municipal projects like the Queen Elizabeth Docks, the Outer Harbour East Headwater (intended in the 1950s and 1960s as the breakwater for a new Toronto harbour; now commonly known as the Leslie Street Spit) and the Canadian National Exhibition sea wall infill (urged by Metro Toronto to replace parkland taken for the Gardiner Expressway). Influenced by recent work in urban environmental history that urges research on the material conditions of city building, my paper shows how the outputs of subway construction influenced scientific understandings of Toronto’s environment, posed temporary environmental implications for local merchants and residents, and permanently altered various landforms in the area. The subway had a direct impact on the urban landscape. This photo, taken in October 1953, shows an open cut section of the Yonge Street subway. 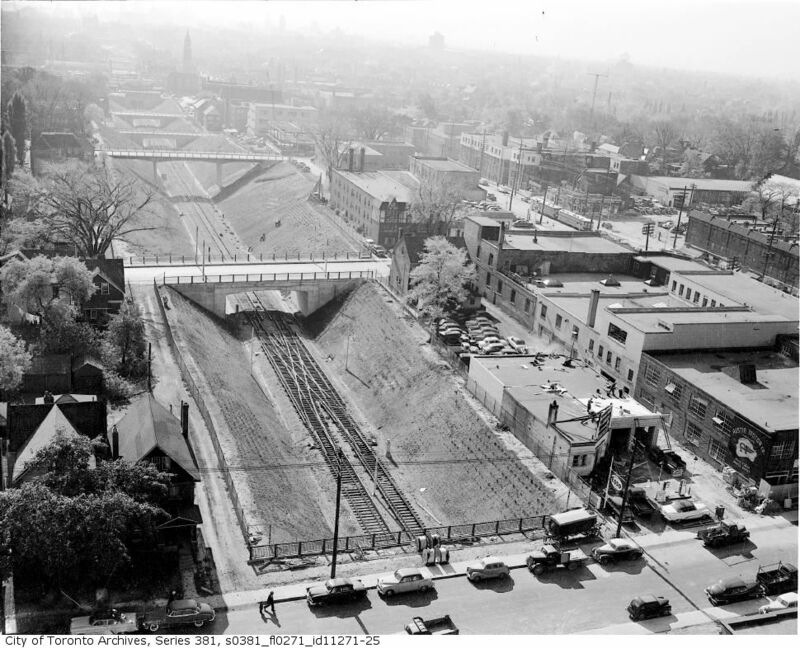 Architect Eric Arthur compared subway open cuts to the city’s ravines. 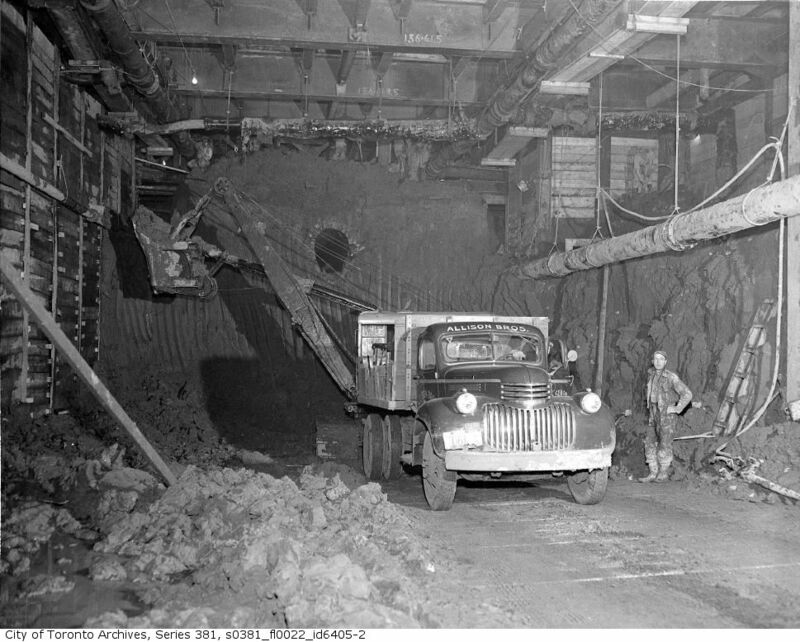 Underground excavation beneath Yonge Street, 1949. By 1966 construction contractors had excavated more than 3 million cubic yards of clay, sand, rock and other materials in order to build 15 miles of rapid transit across Toronto since the city began to build Canada’s first subway in 1949.